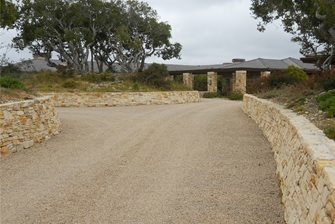 Loose Decomposed Granite - Loose DG, the least expensive type, is simply the granite aggregates, without any additives. Uses for loose DG include landscape mulching, garden paths, patios, play areas and sports courts. Since it is not a solid surface, loose DG provides excellent drainage. Once compacted, a patio or walkway covered with lose DG will be fairly hard. However, loose DG is easily affected by erosion and will need to be filled in often. Avoid laying loose DG near your house because it is easy to track inside, which can be quite messy and may damage hardwood flooring. 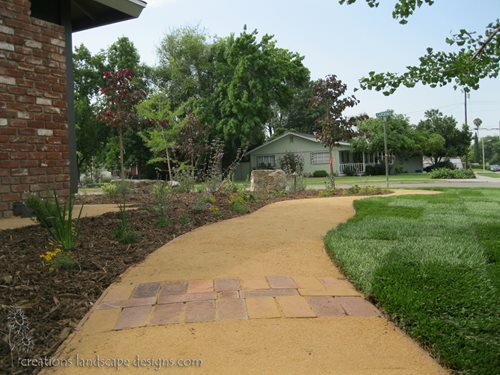 During the winter, when rain is frequent, loose decomposed granite paving will become mushy and muddy. 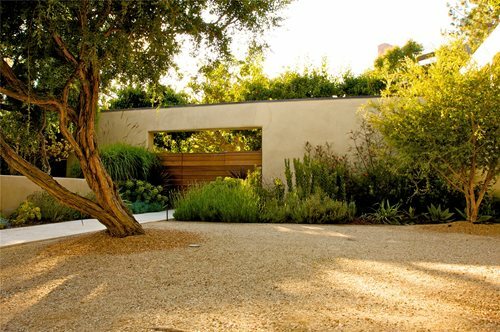 Pro Tip: Decomposed granite is a permeable material that prevents water runoff. A brick inlay will add a nice touch of detail and a pop of color to the beige decomposed granite. 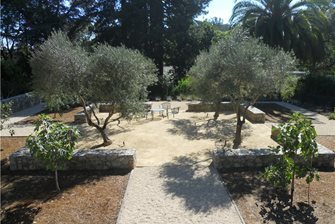 This video showcases a Mediterranean landscape design that used pea gravel and decomposed granite for the patio. Stabilized Decomposed Granite - Stabilized DG has a stabilizer mixed in with the granite aggregates. Compared to loose DG, stabilized DG is more expensive, but it's still less money than pavers, decorative concrete and natural stone. Once spread and compacted, DG with a stabilizer will look similar to loose DG, with the top layer appearing loose and organic. 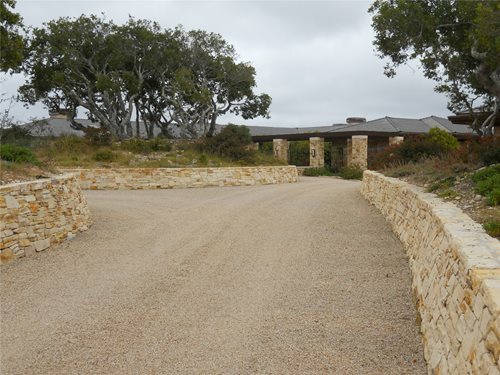 However, stabilized decomposed granite will be less susceptible to erosion. As a result, it has a longer life span and requires less maintenance than loose DG. Many landscaping companies will deliver DG with a stabilizer already mixed in. Pro Tip: I use stabilized DG rather than gravel because it is much softer on the feet. The stabilizer makes the surface strong and keeps it from becoming muddy and washing away in a rainstorm. 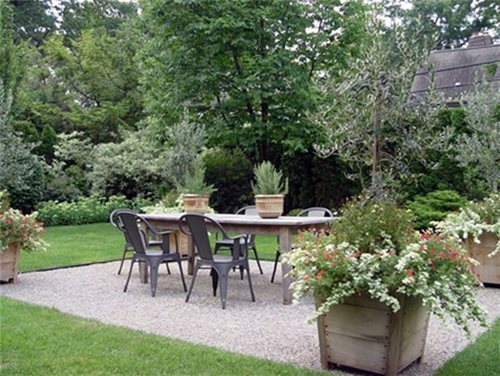 Decomposed Granite with Resin - This is the most costly type of decomposed granite. Resin is added to the DG, creating a surface similar to asphalt. Sometimes called poly pavement, DG with resin is the strongest and most durable DG option, making it great for driveways and high traffic areas. The look will not be as natural as loose or stabilized DG, but it will be much more durable. Pavements made with DG and resin will not erode or be tracked away. One downside to selecting the resin option is that the drainage is nowhere near as good as loose or stabilized DG. Laying Decomposed GraniteLaying decomposed granite is a fairly quick process. First, the area where the DG paving will be laid will be excavated. 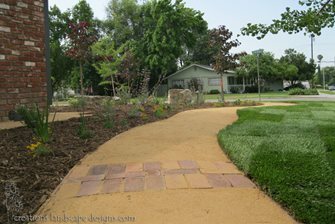 Then, a weed barrier, such as landscaping fabric, should be laid down and landscape edging should be installed around the perimeter. Next, the DG will be placed and compacted. At this point, your patio, walkway or driveway is ready to be used. Depending on the type of decomposed granite you installed you may need to rake and replenish the surface periodically. For this reason it is good to keep some extra decomposed granite of the same color on hand. 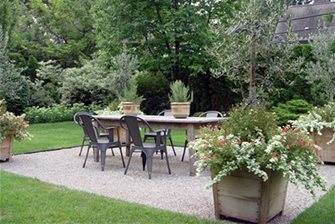 Decomposed Granite and RainWhen thinking about installing a decomposed granite patio or other paved surface in your yard, it is important to consider your climate. 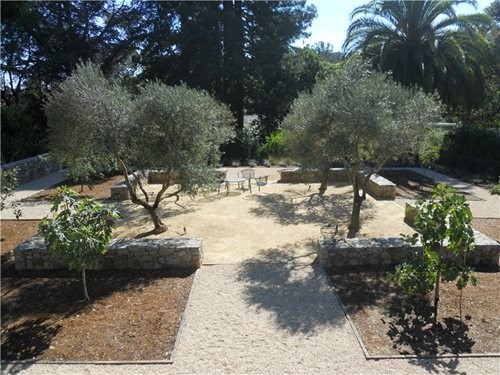 Decomposed granite can successfully be used as a paving material in areas like California that have little rainfall. If you live in a place that gets a considerable amount of rain, DG may be a poor choice because it will erode and turn mushy and muddy.